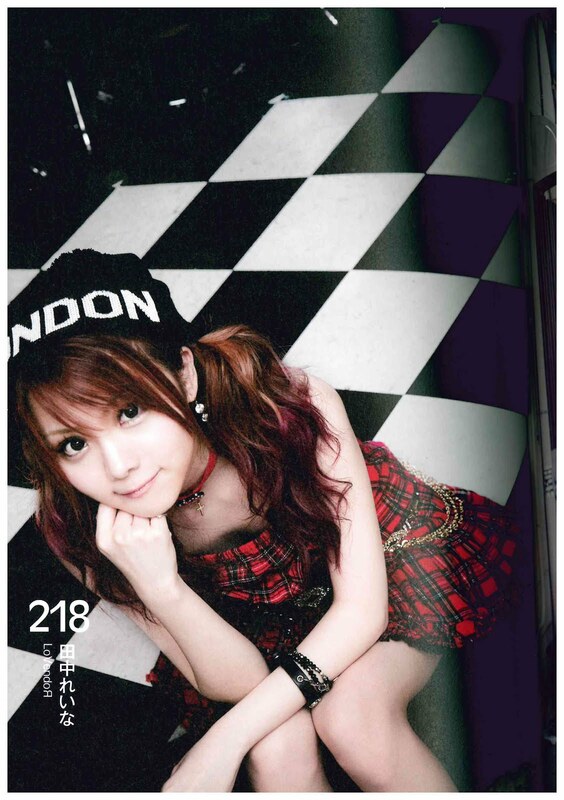 Coming from the same issue of Idol and Read as Karin-chan's epic interview, we have a special interview with former Morning Musume。 Tanaka Reina. While Karin-chan's interview documented the struggles of a young girl making her way in the idol world, Reina is as candid as an (ex-)idol can get, despite having faced hardships herself. What can I say? It's Reina being Reina. Let's get on with the show! When I was in Morning Musume。, it was a given that we'd be singing songs by Tsunku♂-san, and since I'd spent over 10 years in that environment, it didn't hit me just how amazing that was. It was just 'This time around, it's this kind of song huh'. However, once we'd been separated, I kept thinking 'I'd like to sing Tsunku♂-san's songs again', and this time I got to come into contact with Tsunku♂-san's lyrics [through 'Futsuu no Watashi Ganbare!']. I was blessed back then. What sort of family were you brought up in? I often went to karaoke with my family. Both my parents were energetic and active, and they brought me to hang out at all sorts of places. Apparently my Papa and Mama had always been going out since middle school and got married, though Papa's a year younger. So when I asked them 'Why did you go out? ', it turned out that the strongest person in Mama's year was Mama, and the strongest person in Papa's year was Papa, and with that, they became close friends. Maybe my personality is like this because I'm their child (laughs). What sort of person is your mother? Mama will occasionally tick me off by speaking very frankly with me, but the things that she says are generally on the dot. It's frustrating because it hits the mark. But because I know that what my mother says is right, I eventually listen to her. Also, I've recently started cooking, and I'm really enjoying it. But when I realise that I'm really having problems with what I'm cooking, it's amazing how Mama will always pick up the dish from where I left off. Also, you have a younger brother, don't you? I do! My brother... Ah, take a look of this picture of my brother (Shows us a two-shot photo of herself and her younger brother when they were small). Isn't he as cute as anything!? While I was cute in photos when I was small, he goes beyond that. He's cute, isn't he. Like he's of mixed parentage. That's right! Despite being Japanese, he's got the face of a super cute girl, so when we were small, I'd tie his hair, as if he was a girl (laughs). But I hated my brother at the time. You know, since I'd get scolded if anything happened. And my younger brother was relatively weaker than I was. Please tell us about an incident where 'This really caused trouble to my family'. I think what troubled my family the most was when we got split up when I joined Morning Musume。 It was necessary for Mama to come along with me, and we brought along my brother out of concern for him. The 3 of us went to Tokyo, while Papa remained alone at Fukuoka. At the time, I didn't think much of it in particular, but we ended up living apart for over 10 years, and there was even a time when my Papa had to go back and forth to the hospital by himself..... When I heard that story, perhaps if I hadn't entered Morning Musume。 and stayed in Fukuoka, our family wouldn't have ended up being split apart. My brother also expressed that he couldn't get used to his school at all. Had we stayed in Fukuoka, he would have been hanging around with the friends he had from kindergarten, and not have had memories of hardships, yet he had to go to Tokyo in his 1st year of primary school. Despite having neighbourhood acquaintances in Fukuoka, my Mama had to go to a place that she knew completely nothing about, so even now it's like the only acquaintances she has are the mothers of the other members. I think that it was in those aspects that I caused them trouble. Having started this line of work, have you received opinions from your family, like 'How about doing it like that?' or 'What if you do it more like this?'? Did she say nothing when you graduated from Morning Musume。? After doing a lot of worrying, I went to consult Mama, who said 'Yeah, that's enough'. I never thought that she would say those words, so I made my decision with my mind at peace. Like, I'll graduate. Why did she say 'Yeah, that's enough'? Mama'd watched me do my best do my best up to then, I guess. The moment she said that, the energy just came rushing out from throughout my body. I immediately messaged Tsunku♂-san to say that I'd be quitting. Then I got a surprised 'So suddenly?' Though I expect that he was busy, he gave me his undivided attention, asking 'Why?' I was thinking that I would drop everything and return to Fukuoka, but after exchanging messages for a week after that, I stopped in the end. That's when we started with the LoVendoЯ project. And with that, you still continue to sing. Continuing on, I'd like to ask about Tanaka Reina's lifestyle as a student. So what sort of student life did you have in primary school? I wasn't ordinary even in primary school. I was blonde since then, I shaved my eyebrows like it was nothing, I wore shorts and loose socks. No other primary schooler was like that, so I was known in my district despite just being a normal person. Even kids from different schools knew who Reina was. So those who were older than me had their eyes on me (laughs). But school was tons of fun. I'd eat like a pig at lunch service, and we'd compete at the dodgeball court, and in the end we'd have the guys going against the girls. I was that kind of active girl. I was always competing with the boys, I didn't want to lose! You've were competitive ever since then. Did you admire the world of showbiz and singing since [primary school]? Why did you want to become a Morning Musume。 to such an extent? I really like Goto (Maki)-san, and I'd record all of Morning Musume。's television programme appearances on video tape, and watch them over and over. Now I know that what they wore were outfits, but at the time, I thought that those were their own clothes. I mimicked their appearances, that's how much I liked them. I took up the auditions because I wanted to meet Goto-san. Like, if I try it out, I might get to meet her! How was it when you met her? I thought I would die, I was wayyyy nervous! It was for a programme where we had to ride a Ferris Wheel together. I was going crazy. I may not seem like the kind of person who really gets nervous, but my heart was in a complete panic. Then I talked about all sorts of things with Goto-san, and she said that I resembled her, which made me super happy! Since then, I constantly thought like crazy that I wanted to become Goto-san. But once Goto-san graduated from Hello! Project, I had no opportunities to meet with her, so I thought that I'd go and find myself. While stealing the positive points of various senpai, I gradually was able to become Tanaka Reina. Since when did you start to enjoy Morning Musume。 activities? When I realised that I was visibly the most popular. There was a point in time when everyone was holding my uchiwas, and I heard from out manager-san that 'Reina's photos are selling well'. My confidence level was like, 'Without Reina, Morning Musume。 would be hopeless', that was when I had the most fun. In my mind, I was glad that I had done it! What impression do you have of your own graduation concert? It was the most fun I've ever had in my life. I had tons of confidence, and everyone was watching me. I invited everyone I knew to come to that day, even the people that I'd normally be a bit embarrassed if they were to see me. I strongly felt that I wanted them to come, so I called them, but I had the most confidence in myself at that graduation concert. I didn't feel sad at all. I was like, if anything, watch me now. On that day, you were really cool. It's great that you didn't cry, and while your senpai and your contemporaries would have the end of their graduation performances decorated with 'Namidacchi', you went 'Naitesumunara Nakiyagare!' (If it's settled with crying, then cry!) in 'Shabondama'. That is true (laughs). The final song was my choice. So I knew that it had to be 'Shabondama'. And in run-of-the-mill graduation ceremonies, all the members give words and flowers to the graduate, right? But on that day, I responded to their messages. That was Tsunku♂-san's suggestion, 'Ending it with just listening to the tales of the members would be unlike Reina. Since I'd like it to be a graduation that reflects Reina, I think it would be good if you said what you thought about the members'. So on the day before that, I thought about what I wanted to say to each and every member. So I said things like 'Ishida's fashion sense is lame' at the end (laughs). That's how my graduation ceremony was like. Do you pay attention to Maachan, who idolises you? Sato... I don't pay attention to her! When she contacts me at times when she's in a bit of a low mood, I wonder if she's alright. But out of those times? Not really (laughs). That girl has a good head on her shoulders. She can get on fine with the world, so she'll be fine. Definitely. When you were an idol, you were said to be un-idol-like, but once you joined a band, you're said to be idol-ish (laughs). That's right! But I think of those as words of praise instead. The audience's reaction is different to when you were an idol, and you're not really able to have concerts at huge venues like the Budokan, so how did you feel after seeing the various realities faced by bands? In the first year, I really understood how truly amazing it was to have the label of Morning Musume。 There was a point in time when I wanted a label, wondering if I'd always be referred to as a former Morning Musume。(laughs), but I overcame that as well, and now I want to have concerts at big venues soon. Also, I'd like to bring up the volume of my voice even higher. What I've noticed is that bands sound better with a bigger voice (laughs). So now I'm practising to bring out a bigger voice. Should we keep our expectations up for Tanaka Reina in the future?